For the last 15 years, I’ve battled with lost glasses, ripped contacts, and sub-par vision. The promise of being able to see 20/20 less than 24 hours after the procedure was AMAZING! I’m seeing crystal clear for the first time in my life! My journey began about two and a half years ago, when I had my eyes tested at a local eye clinic. They discovered unusual pressure in my right eye, and I was referred to Dr. Pugh at Eye Associates in Jeffersonville. Dr. Pugh discovered that I had glaucoma in my right eye and cataract formation in both right and left eyes. The cataracts were not ready to be removed, so I embarked on a two year journey of being monitored and checked every 4–6 months. My long and short distance vision had been gradually getting worse for several years and I had to wear glasses for reading and long distance. The long distance was the biggest problem for me, as I am an outdoors person that loves to hunt and glasses made it difficult to focus. Dr. Pugh was very interested in my glaucoma condition in my right eye, as there seemed no logical explanation as to why it was just in my right eye. We talked about my background and he explained what he thought would be best for me and was very assuring and gave me the greatest confidence in going forward. 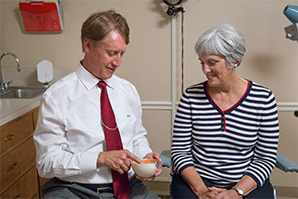 Dr. Pugh and his whole medical team were just great, very friendly and professional, making you feel completely at ease through the whole procedure. I began to notice improvement in my long distance vision the next day after surgery. My long distance vision is perfect now, 20/20. It has made my everyday life so much easier, I can see to drive and hunt without having to wear glasses, and I don’t bump into things like I did when I was wearing glasses all the time. I had heard about the IOL technology but, to be honest, was a little concerned about having my eyes operated on. But after consulting with Dr. Pugh he instilled all the confidence I needed to proceed. I would tell anyone thinking of having this surgery to contact Dr. Pugh and his team at Eye Associates.